Of the eight provincial capitals in Spain’s southernmost region of Andalucía, Jaén too often gets short shrift in favor of historic cities that overwhelm you with their monuments—Sevilla with its gigantic Gothic cathedral, Córdoba with what remains of the Great Mosque, and Granada with the country’s crown jewel, the Alhambra palace—or in favor of coastal cities that entice you with their beaches and fresh seafood—Málaga, which needs no introduction, Cádiz, Europe’s oldest city, Almería, secluded away behind deserts and mountain ranges, and Huelva, where Columbus set off for the Americas. I ponder this as I grow more and more impatient with the intercity bus I’m on…and more and more nauseated. The air coming from the A/C vents smells like a dirty bathroom, the advertised on-board WiFi has ground to a halt, and that hot summer sun is really bearing down on the windows. I’m reminded of the bad first experience I had with Jaén (pronounced “khah-EN” [xaˈen]) when I moved to Spain and had to come to an ugly part of town to process my paperwork for residency. Having to deal with government bureaucracy would make anybody hate a city, and I initially wrote off Jaén for months until I returned as a tourist rather than a hapless foreigner. But by the time I warmed to Jaén, my sojourn in southern Spain had come to an end and it felt as if a budding friendship were cut short by a move. So here I am in Andalucía again, making a “farewell tour” of my old haunts before I move back to Texas after teaching English in Spain for three years. I’ve already gone out for snails and shandies with my friend Cat in Sevilla and caught up with my former English teacher colleague in Úbeda (my adopted pueblo in Spain), so now it’s time for the finale: Jaén. As the bus gets closer to the peaks of the Sierra Mágina, the city materializes from the vast acres of olive groves. Towering over Jaén is the cathedral, the finest Renaissance-style church in the country that is rarely, if ever recognized as such. The city comes into focus as we pass through exurban housing developments and an abandoned tram line, and we soon reach the bus station. In a province like Jaén that boasts little real train service, the provincial capital usually functions as the area’s main transit hub: buses depart for agricultural towns like Alcaudete, industrial centers like Linares, or World Heritage Sites like Baeza. In many ways Jaén still lives up to its original Arabic name, Yayyan, referring to its role as a crossroads for caravan routes in medieval Moorish Spain. As I fasten the hip belt on my fully-packed backpack, I realize that I’ve got a world of hurt coming my way: it’s over 100º F on this cloudless summer afternoon, I’ve made the mistake of wearing jeans rather than shorts, and my hostel is 20 minutes away on foot…and up several hills. It’s not long before I begin to feel self-conscious of how sweaty I am, but I feel refreshed by the familiar smell of frying garlic wafting from open kitchen windows or flamenco music blasting from subcompact cars that rattle down cobblestone streets. My hostel lives up to its reputation as a Hostelling International property: it’s cold, sterile, and quiet, but at this point I welcome an escape from the hot, dirty, loud Spanish streets. Once I’m free of my heavy backpack and I’m wearing shorts instead of jeans, I head back out into the city and let the soft evening breeze cool me down. A tavern called La Manchega exerts an irresistible gravitation on me, and my muscle memory quickly takes me down a tight, sunless passageway where this Jaén establishment has welcomed patrons since 1886. I pull up a seat at a worn wooden counter and ask for a glass of fino, dry Spanish sherry. The bartender delivers it in a miniature, conical wine glass, but the fortified wine has a full-size mouth reminiscent of raisins: the spirit of Andalucía contained in a glass. While I take in the walls plastered with posters and photos from bullfights long gone, I munch on the free tapa of ensaladilla rusa, a “Russian” potato salad flecked with flakes of tuna. A mustachioed, skinny old man who’s probably been a fixture at this bar for a large fraction of its history extracts an olive pit from between his teeth and mutters “hijueputa” under his breath—“sonuvabitch”—when Venezuelan dictator president Nicolás Maduro comes on the TV. A gaggle of old ladies comes in not long after and adds some liveliness to this windowless bar as they ask for tintos de verano and beers with and without alcohol. I have some buyer’s remorse when I look over at their table and see that they got free tapas of migas or garlic-fried breadcrumbs. Guess I’ll have to come back again tomorrow night. The next morning, I shuffle into the bathroom and wash my face, a desperate morning ritual to try to wake myself up…but coffee is needed for that. I head out from my hostel onto the main drag of the Magdalena neighborhood, the historic core of Jaén. The district’s namesake church isn’t far, so I peek between gaps in a weathered wood door to catch a glimpse of the church’s pleasant courtyard. Within lies a placid pool surrounded by unmistakable horseshoe-shaped Moorish arches—this church was once a mosque, this tiny cloister an ablutions courtyard used for ritual washing before prayer. Rubbing my eyes, I turn back to the street and find that I’m just as bleary-eyed as everyone else I walk past…but hardly as well-dressed or put together. The clack-clack-clacking of persianas (plastic, blackout window blinds) being raised draws my attention upward, but I have to stay alert: an apron-clad homemaker finishes mopping the entryway to her apartment and proceeds to empty the dirty water from her bucket into the street. I leave behind this residential area and find the pedestrian-only street narrowing to make way for patio seating, generously shaded by thick black canopies with contrasting white sponsor logos from beer brands or Coca-Cola. Strategically positioning myself upwind from a smoker, I cozy up to one of these terraza tables and grab a quickly-crumpling copy of the local newspaper to leaf through during breakfast. The first meal of the day is light yet invigorating: a short, runny café con leche paired with a slice of mass-produced baguette toast upon which has been drizzled green olive oil, grated tomato, and glossy, translucent cured ham. I try to look like a concerned resident and read an article about the regional president’s election woes…but all the jiennenses around me are focused on the sports section instead. Now a few one-euro coins lighter, I zero in on my major touristic visit for the day, the cathedral. The sheer face of this Renaissance masterpiece automatically turns the Plaza de Santa María into a monumental public space, although this is somewhat diminished by the loud diesel buses as they curve around the bollards that define the square. I take a seat on a cracked slab of concrete that apparently was intended as a bench; looking up at the façade in front of me, which is comparatively dripping with lifelike statues, I feel the jitters of caffeine starting to take effect, but more strongly, the shockwaves of remembrance. It was here, in this very plaza, that three years ago I met up with a couple dozen fellow English-speaking foreigners and marched off for our snooze-inducing orientation on teaching our mother tongue in public schools. The three years that followed would be rich in challenging, yet rewarding, experiences. Intimate friendships based on shared circumstances would fizzle out as quickly as they were sparked; hospitable Spaniards would expand my palate to include snails, octopus, and plain, green olives; modern high-speed trains would take me to centuries-old towns equally proud of their art and architecture as they were of their flavorful, traditional dishes; eager-yet-exhausting Spanish children would soak up my English vocabulary…but also my desire to ever teach again; and my family would always remain eight hours behind and at the mercy of spotty internet connections. The toll of the cathedral’s bells stumbles across the plaza, so I switch on the camera that hangs on my shoulder and step inside this house of worship. Compared to the outdoors, it is a truly holy place—set apart from the noise, the activity, the grime. Soaring pillars stretch upward and support a vast ceiling of domes upon domes. We moderns gawk and crane our necks at grand and graceful buildings like the Catedral de Santa María, but we also have skyscrapers and space stations to take us to the heavens. How much more would have 16th-century Spaniards been transported in the presence of such monumental stonework and glittering gold when their whole world was the fields, the hills, and whitewashed towns? True to its Renaissance form, the cathedral gleams with idealism: perfect forms like circles, squares, and circles within squares abound, as do the classical orders of columns and triumphal arch-shaped windows. The fragrances of smoking incense, burning wax, and creaky carved walnut wood vie for my attention, my veneration. These smells, once so foreign to me, have become familiar and comfortable, indicator species of a Catholic Spain that is rapidly secularizing. This same Catholic Spain once shared the streets with Jewish Spaniards, whose presence is now only faintly remembered within the claustrophobic streets of Jaén’s old Jewish Quarter. I wander into the judería only after running circles around a post office and a corner grocery store. To this day, the wedge-shaped neighborhood is still difficult to find—but this was by design, of course: in medieval times, there were only three “gates” in or out of the Jewish barrio, not to keep the Jews in, but to keep their potentially-hostile neighbors out. Sadly, little remains of Jaén’s Jewish heritage. I can only find two stars of David peeking out from otherwise plain whitewashed walls, and where a synagogue would have been now sits the Church of San Andrés. But the city has not forgotten its long-evicted residents: a gigantic menorah stands at the entrance to the old Jewish quarter in honor of the residents who used to live here. There’s a memorial plaque written in both Castilian and Ladino, the ossified 15th-century Spanish that Sephardic Jews took with them after they were thrown out of their homes. Exiting these cool, quiet, almost-haunted streets, I return to the noise of modern Spain, where I soon meet up in person with a friend I have known only via Facebook and her blog for several years. We clink our glasses of tinto de verano together and say the Spanish onomatopoeia “chin-chin” before sipping the ice-cold, lemon-infused mixture of red wine and sweet, bubbly soda. The free tapas that come with our refreshing drinks keep us busy until our main courses arrive: lomo de orza—pork loin slow-cooked in olive oil with roasted red peppers—and a sartén alpujarreña, a “frying pan” of chorizo, blood sausage, potatoes, fried eggs, and green peppers. Such heavy eating makes me sleepy, so after giving dos besos to my friend I head on back to my hostel, where I indulge in the Spanish siesta…after all, it’s way too hot to be outside and everything is closed for lunch anyways. I stumble out of the hostel in a daze as the late-afternoon haze slowly lifts from the city: shopkeepers raise the metal grating in front of their storefronts, children hurry back to school for a handful of afternoon classes, and office workers at patio tables look mournfully at the dregs of espresso left in tiny cups. The walk back into the city leaves me sweaty and weak, so I “reponer fuerzas” or “regain my strength” at a flamenco bar painted bold Andalusian green. Posters and photos of famous singers and guitar players cover almost every square inch of the Peña Flamenco’s walls, and I can only imagine the kind of soulful expression these walls listen to every evening. I order a glass of made-in-house vermouth and receive a dish of salty almonds and a ramekin of juicy meatballs to go along with this herby, spicy drink. Only the sports newspaper is left on the counter, so I pull up a seat by the windows instead and people-watch as a faint breeze saunters by. The streets of Jaén are haunted by many ghosts, from those of the Jews who used to live here to that of Andrés de Vandelvira, the Renaissance architect who designed the cathedral and who is buried in a nearby church. They’re joined by the Muslims, who also contributed to this city of three cultures. A mosque in the Magdalena neighborhood has long since been converted into a church, but some sprawling public baths escaped destruction. I step down into the basement of a palace fit for a Renaissance nobleman and begin to explore the baños árabes that commoners would have used to bathe in during medieval times. 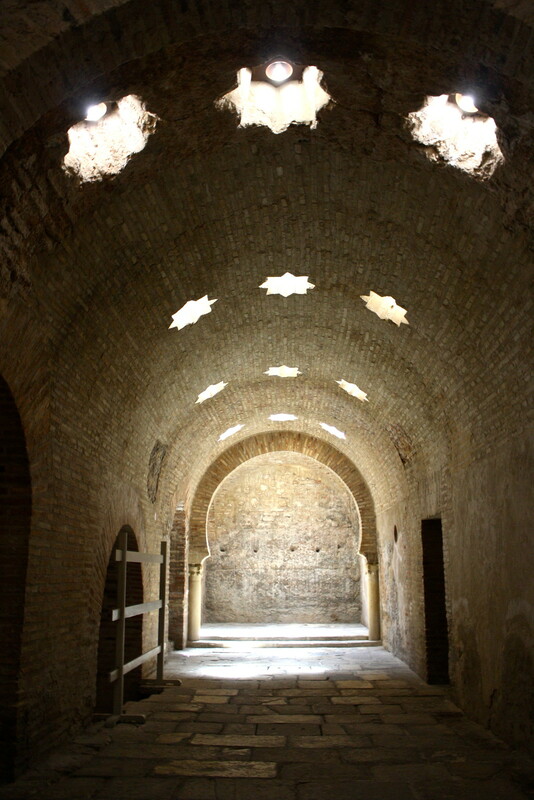 It’s clear that Jaén’s Moorish Baths are some of the largest and best-preserved in southern Spain: crisp horseshoe arches jump from one corner of the baths to another, and cisterns built from bricks still endure. The humid baths are noiseless and smell almost like a musty cave, but sunlight from above pours in from eight-sided stars cut out of the ceiling. The stillness of the baths makes me restless in a country with no concept of Inside Voices, so I return to the surface streets, where I begin my hike up to the top of the Cerro de Santa Catalina, a steep hill that overlooks the city. By the time I reach the summit, parched and sweaty, I find myself wanting some sort of public bath to refresh myself in. There’s no such thing, but there is a surprise: as I continue along the trail, I walk past a group of guys at a picnic table studded with several bottles of Cruzcampo. In this quiet clearing, lacking any audience, they spontaneously break out into flamenco. One man sings, expertly nailing the Eastern-influenced grace notes, while his buddies effortlessly clap to the irregular time signature that the flamenco is known for. This is pura Andalucía. Crowning the Santa Catalina hill is Jaén’s Parador, one of many upscale, government-run hotels set in historic locations. I mooch off the public drinking fountains inside before moving on to the medieval castle next door. From outside this castle’s sandstone walls, I take in the panoramic views of Jaén—perhaps the finest lookout point in Andalucía. The city fans out from the foothills out toward the plains, where olive orchards quickly take over, the mainstay of the region’s economy. I can appreciate the scale of the gargantuan cathedral from up here as it truly dwarfs the surrounding apartment homes that rarely reach past seven or eight stories tall. Parish churches orbit the cathedral like moons, while historic palaces seem more like artificial satellites. I wait at this perch for the perfect picture, impatiently watching as the sky imperceptibly turns an inky dark blue and wondering when the city will ever going to turn on the street lights. When they finally switch them on at 9:45pm, I pounce at the opportunity to photograph the now-lit-up streets and churches of Jaén with a stunning blue backdrop. Villages like Úbeda and Baeza glitter like dying embers out in the distance; the Blue Hour is quickly snuffed out after a brief 15 minutes. My pictures, however, are saved. I jog down the mountainside as night displaces the blue evening sky, and I’m in full Dinner Mode at 10pm. I return to the city via the charming, colorful La Merced neighborhood, the neighborhood of a thousand steps. Fortunately for this hungry boy, I’m heading down, not up, back into the historic core, where I reprise my dinner from the night before at La Manchega. Hot, sweltering summer days in southern Spain call for nights of icy-cold tinto de verano, which I order at the wooden bar that may not have ever been refinished since the establishment first opened in the 1880s. I make sure to ask for a free tapa of migas, that economical dish of breadcrumbs fried with garlic and sausages. The fluffy bite I scoop up is moist and flavorful—just as fieldhands would have wanted it decades ago. Just as I’m finishing my migas, the bartender slides my way a cazuelita or round clay dish of chilled salmorejo, a thick emulsion of tomato flesh, bread, and olive oil topped with boiled egg and cured ham. I can’t think of a better way to round out my time in Jaén than cooling off with this umami-rich dish. Tomorrow, I will ride the train out of the olive groves back to Sevilla. There, I will catch my budget Ryanair flight back to Santiago de Compostela, where I will spend a few short weeks until it’s time to drag myself and my belongings down to the station to hop on the train to Madrid, to the airport, to the gate where an Iberia plane will take me across the ocean back to Texas, back home. 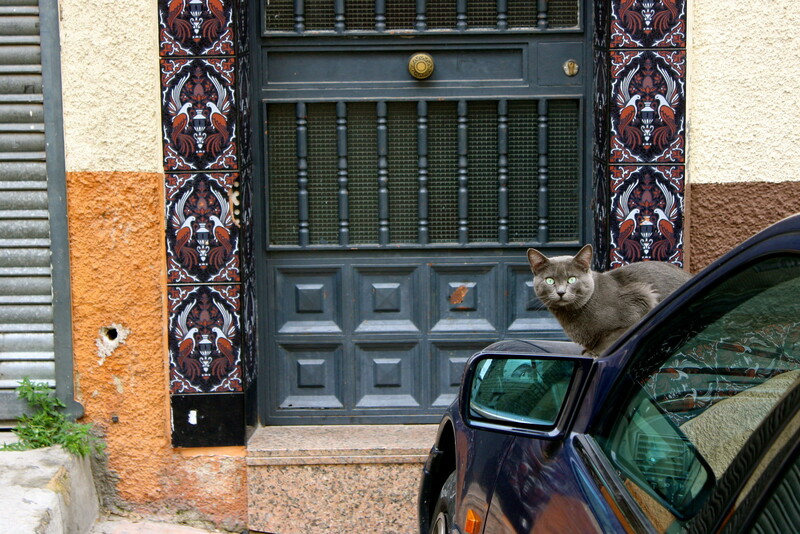 The crowds will always have Granada and her faux-Moorish façade or Sevilla, the region’s loud, beating heart. But Jaén will always be for me an almost-secret refuge I can return to when I’m looking for what makes Andalucía such a special place in this world. 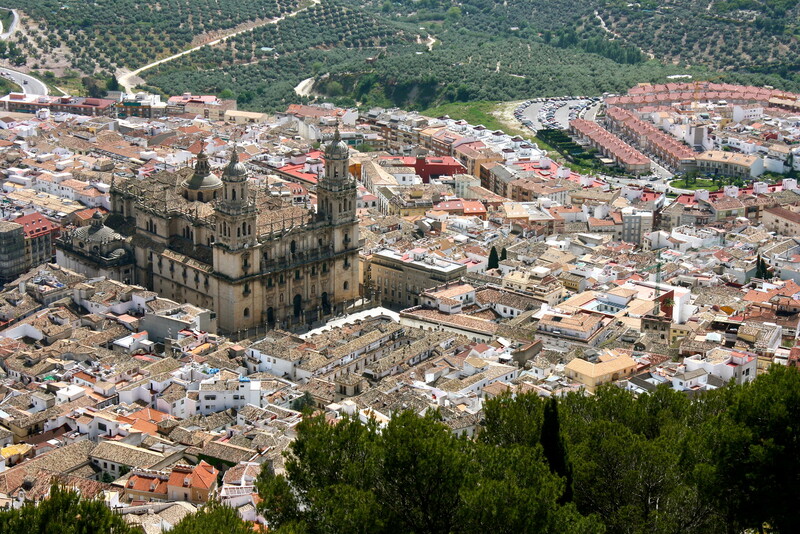 Have you ever been to the city of Jaén before? What would you consider to be Andalucía’s most underrated city? Tell me below in the comments section!